Mastering vocabulary is an essential part of learning a foreign language. And then what is the most difficult Korean vocabulary to learn? It's the verbs and adjectives. These books were designed to help learner's master basic Korean verbs/ adverbs by much innovated methods. For each vocabulary item, you can see its pronunciation, Romanization, meaning, and the "model verb/ adverb" that it follows the same conjugation rules as. And then there is also the verb/ adverb's table of conjugation, some familiar related words, common sentence patterns, and some sample sentences. I dare say that this is all the essential and practical information you'll need in order to master each verb/ adverb. 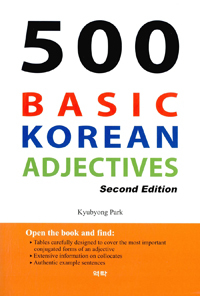 So I hope you will treat these books like a dictionary as well as a guide to studying Korean verbs/ adverbs.